After a long period of quiet surrounding the upcoming Annual Pass content, Bungie has finally lifted the lid on at least some of the activities, events, and content we can expect to see. This week began Destiny 2’s fifth season, the Season of the Forge. The changeover that came with update 2.1.0 sets the stage for Black Armory to start rolling out on December 4, 2018. Unlike previous mid-year expansions that dropped most all content on day one, Black Armory and the other two Annual Pass releases—Joker’s Wild and Penumbra—will serve to evolve the game over time. Players will have more reasons to come back and discover new things to do and loot to earn week after week. While there will certainly be additional secrets and discoveries over time, Bungie laid out an in-depth outline of what we can expect over the next nine months of the game, including Black Armory and beyond. You can get a good look at exactly what Bungie is going for with this new strategy in the ViDoc above. Bungie doesn’t think of Destiny 2 as a boxed product anymore. It is an evolving world of content, gear, and activities that will deliver constant surprises and things to do over time. 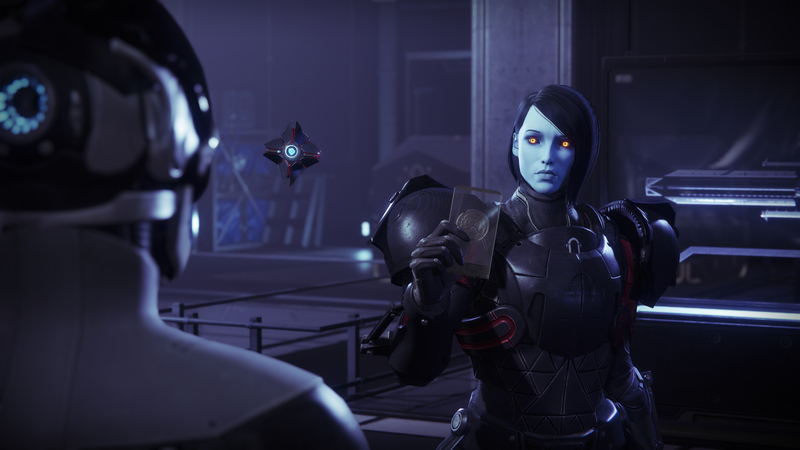 Black Armory is the first of three releases for the Destiny 2 Annual Pass, each of which will frame new seasons of content around different themes. A new area will open up within the Tower, allowing Guardians to speak with ADA-1, the exo who has been guarding the secrets of the Black Armory. New weapons, armor, and other surprises will be released during the course of Season 5 for those who own the Annual Pass. When Can I Play Black Armory? Unlike other content drops that give players nearly all of the content at once, the new activities in Black Armory will be released to players over time beginning on December 4, 2018, and running through March 4, 2019. It’s assumed that Season 6, the Season of the Drifter will then begin on March 5, with the Joker’s Wild Annual Pass content starting to release either that same day or the following week on March 12. 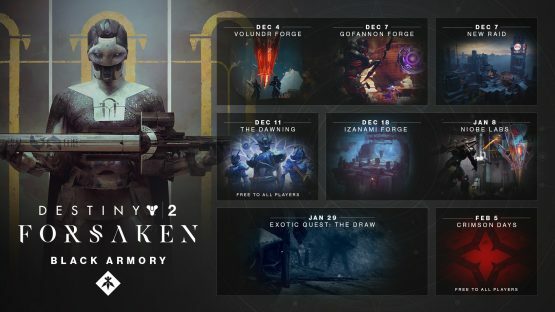 The calendar of events for Destiny 2 Black Armory. Click to enlarge. Specifically for Black Armory, the Volundr Forge will open up on December 4. The Gofannon Forge will follow on December 7, with the new Raid, Scourge of the Past, dropping on the same day. December 11 will begin The Dawning, Destiny’s yearly holiday seasonal event. That will run through to January 1, 2019. December 18 will unlock the Izanami Forge. More information on the Lost Forges below. Going into the new year, January 8, 2019 sees the release of Niobe Labs, which has yet to be detailed. January 29 will begin the Exotic quest called The Draw. And February 5 is when Crimson Days will start, the yearly Valentine’s Day event. Of course additional regular events like Iron Banner will be scattered throughout the season, and we’re sure that Bungie has some surprises up their sleeves that aren’t being openly displayed on the road map. What are the Lost Forges? Black Armory introduces a whole new three-player activity called Lost Forges. Inspired by the likes of Escalation Protocol and The Blind Well, it’s a horde mode with additional objectives. Players will be tasked with literally forging their own weapons by tossing components into the forge while fighting off waves of enemies. The three Forges were created by three Golden Age families, coming from Norse, French, and Japanese backgrounds. The weapons and gear created by the Forges will retain the aesthetics of each background. Forges are matchmade activities, so even if you don’t have a fireteam, you’ll be matched with two other Guardians ready to craft weapons of their own. Bungie says this activity is considered endgame and will be pretty tough. It will start out above the current power cap of 600. Bungie calls the activity an “uphill climb” if you aren’t at proper Power levels. There will also be exclusive weapons and rewards for each Forge, including Exotics. Volundry, Gofannon, and Izanami Forges will be progressively unlocked over the first couple of weeks that Black Armory is out. Early next year we’ll see Niobe Labs, which doesn’t seem to be the same thing as the three Golden Age Forges. The PlayStation Blog had a Q&A with Bungie about the Forges, their purpose, and Bungie’s thoughts behind their production. Black Armory will not include entirely new planets. It’s not a yearly expansion on the level of Forsaken. In many ways, Black Armory simply evolves and expands Forsaken to be more robust with a continuing endgame experience for players. There will be bubble locations added to existing destinations, so players will have something new to explore, including an expanded Tower and the Lost Forges. The Raid also takes place in an all new area that players have never gone before. Is There a Power Cap Increase? What’s the Black Armory’s Story? 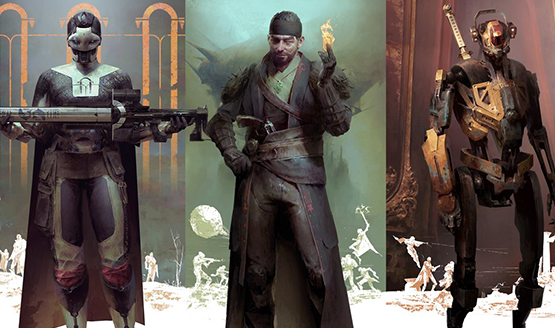 Bungie is stepping away from the traditional one-and-done campaigns we’ve seen in the past. Black Armory and the rest of the Annual Pass releases will focus more on delivering engaging endgame activities that will keep players invested long term. Short cinematic story campaigns as we know them are gone in favor of delivering lore and story organically. Some datamining has revealed that there will still be cutscenes that deliver story in some capacity, but much of the story will be found within the lore tabs on items and embedded story in the world and activities. Opening up a whole new section in the Tower and a new vendor is already revealing a lot about the world of Destiny that we didn’t know before, and as the Lost Forges continue to unlock, more will be unveiled. Scourge of the Past is Black Armory’s Raid, taking place in the ruins of the Last City. Bungie has already confirmed that this Raid will be “much larger” than the Raid Lairs that were included for the Leviathan, but smaller than Last Wish, which is the biggest Raid Bungie has ever done. The ViDoc above has some hints about what challenges the Raid will contain, including long demanded vehicle sections showing Guardians driving through some areas on their sparrows. The Raid will release on December 7. It’s currently unknown what the required and max Power levels for the encounters will be. To get a sneak peek at the Raid, make sure to watch the ViDoc. What About the New Gear? You bet there’s some great new gear, including some amazing Exotic weapons that players can add to their arsenal. Anarchy is a Fallen-themed grenade launcher that creates sticky arc mines. Arc bolts connect to other arc mines, making an arc web. Le Monarque is the French-inspired bow, and Destiny 1 players will be pleased to know it works much like Thorn. Precision hits create a damaging void cloud. Izanagi’s Burden is a sniper rifle from the Japanese Forge, allowing players to collapse all shots into a single massively damaging shot. Jotun is an arm blaster fusion rifle that Guardians wear on their arm like Mega Man. It fires a slug that burns the ground where it hits. Oh, and it can track enemies. Finally (at least considering there are no other surprises), The Last Word is rumored to make a comeback with an exclusive quest launching on January 29, 2019. What About the Rest of the Annual Pass? Once Season 5 concludes, we’ll enter the Season of the Drifter. 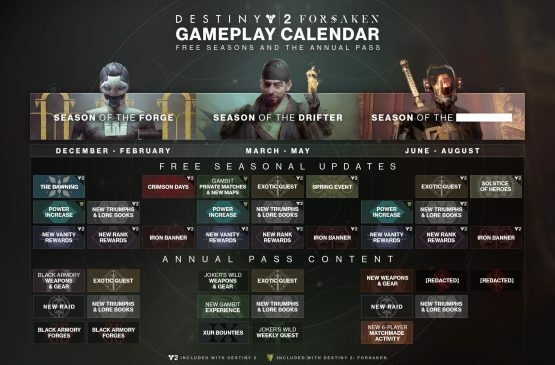 Scheduled to launch in March, Season of the Drifter and Joker’s Wild will focus on Gambit, with new pinnacle (or endgame) Gambit activities, quests that involve the Drifter, and new maps finally coming for the mode. Penumbra is the content release for Season of the [REDACTED], though leaks say that it will be called Season of the Shadow. Bungie is being very mysterious about this Season 7 content, saying only that the focus will be on “discovery, subversion, and exciting new secrets.” From the teases we’ve seen so far, it looks like Penumbra could revolve around Calus and the story following the Leviathan Raid. You can watch the ViDoc to see if you catch any more hints based on the short footage shown. 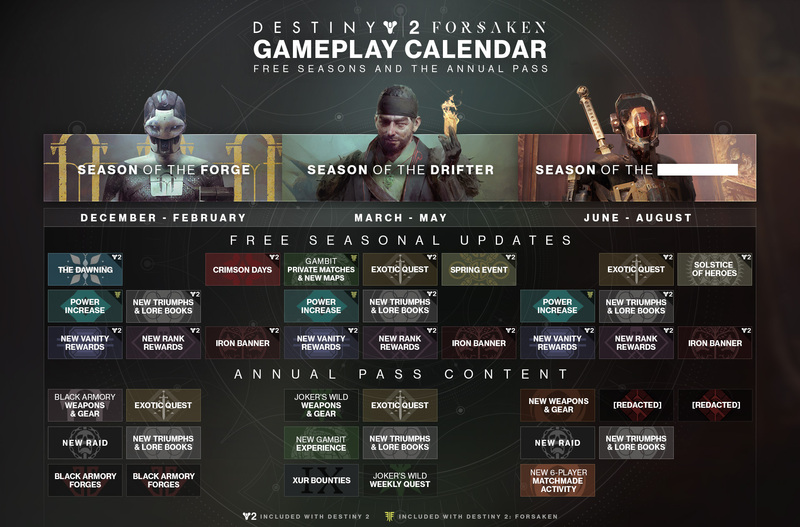 The Destiny 2 Annual Pass calendar. Click to enlarge. Events, activities, quests, and new gear will be dropped throughout all of the Annual Pass content releases, giving players something new to do nearly every week. Bungie wants Destiny 2 to be a game that players can pick up at any time and have something to play, whether they obsessively grind the content or only play once in a while. In a lot of ways, the Annual Pass is more like a subscription to the next nine months of Destiny 2, rather than the purchase of a proper singular expansion. For this reason, Black Armory (nor Joker’s Wild or Penumbra) can be purchased separately. By bundling it all together, it allows Bungie to easily allocate content and updates depending on what you own. If you own just the base Destiny 2 game you’ll still get access to certain events other updates, as well as unfettered access to the Crucible PvP mode. Forsaken adds access to a little bit more content throughout the year such as the Power level increases, and the Annual Pass will make sure players get to experience everything that Bungie is adding into the game. Now that we have a solid map showing where Destiny 2 is headed throughout the next nine months, what are your thoughts on the Annual Pass and what Bungie is trying to do with Destiny? Is this a good model for an evolving and living online game? Will you miss the traditional campaigns, or are you excited for more endgame pursuits to tackle? Let us know all of your thoughts about Destiny 2 Black Armory and the Annual Pass in the comments below.